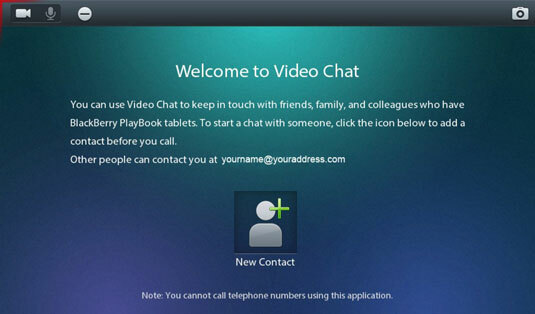 The Video Chat app, at least in its initial version, only works from one BlackBerry PlayBook to another BlackBerry PlayBook. It won’t work from your tablet to a BlackBerry smartphone or from your tablet to a PC or other device. Video Chat allows you to speak with and see another person or another place in real time. Using a WiFi connection from your PlayBook, it sends live video and audio from your tablet and gets the same from another. That’s way cool: you can conduct a business meeting without having to go through a strip search at the airport; you can conduct a pseudo-intimate conversation with a loved one. You can switch from the front-facing camera (the one that is located just above the touchscreen) to the rear-facing camera (the one on the back of the tablet). The conversation uses the built-in microphones, so no extra hardware is required. 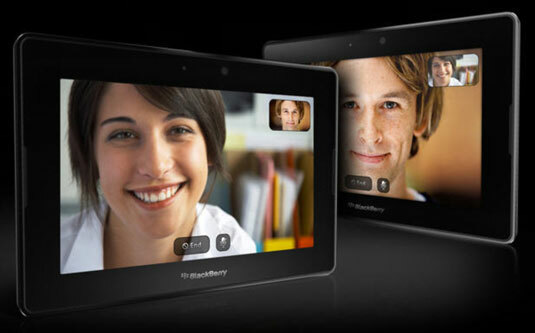 The first time you initiate a video chat, enter the BlackBerry ID for the person you want to chat with. Before you place your call, you can tap on the camera icon in the upper-right corner of the Video Chat app for a preview of how you will look to the recipient; think of it as an electronic mirror to adjust your makeup, check your shave, or fix your hair. Initiate a video call by tapping the ID in your contacts list. The person you seek to chat with gets an on-screen pop-up notice. The recipient can accept a video or voice call, or decline the call. Users can also set a Do Not Disturb flag on their device so all incoming calls are ignored until the sign is removed. While a call is underway, you can switch cameras from front to rear so that the viewers at the other end can either see you talking to them, or see what you’re seeing on the other side of the tablet. Either end can mute or unmute the audio while a call is in progress, or choose to accept an incoming call for voice only. Thus dealing with wardrobe malfunctions, or perhaps the complete absence of wardrobe. Some IT departments may have set up security that interferes with using the Video Chat feature. So, too, some WiFi routers may introduce problems because of security firewalls. You can seek the assistance of RIM’s support team if you have this sort of problem, but in the end you may have to change security settings on your own equipment to allow video chatting to take place.